Consistent delivery of powerful innovations requires significant investment. These firms are all in. The market of life science tools and technology providers has undergone only a few changes since the last time GEN published this list more than a year ago. Some of the major driving factors for the growth of the life sciences tools market include rising demand from various research and pharmaceutical companies, the increasing incidence of new and drug-resistant diseases, and technological advancement in the various life science fields, according to a report from Transparency Market Research. But the changes to this year’s GEN listing are huge: Life Technologies has been acquired by Thermo Fisher Scientific for $13.6 billion, plus $1.5 billion in debt, in a deal completed February 2 of this year, while Complete Genomics’ $117.6 million acquisition by BGI Shenzhen was completed on March 18, 2013. As a result, Life Tech and Complete Genomics aren’t within this year’s list of top 20 life sciences tools and technologies providers—a list that includes both companies and divisions of broader corporate giants as ranked by their R&D spending for 2012. Listings include R&D spending for 2012 and 2011, the percentage difference between the two years, the percentage of sales for both years, and 2008 R&D spending and percentage of sales. Figures were disclosed by the companies in forms 10-K or 20-F, filed with the U.S. Securities and Exchange Commission (SEC); corporate annual reports; quarterly results press releases, and S-1 Securities Registration Statements also filed with the SEC. Where applicable, figures were converted to U.S. dollars from other currencies on July 7, 2014. 2 Figure is the same as reported in company’s Form 10-K for 2012, but differs from the $54.115 million originally reported for 2012 in a company press release dated March 7, 2013. Sequenom last year restated previously filed financial statements and data for periods that included the first three quarters of 2012. The restatements included the reclassification to “selling and marketing expenses” a total $2.5 million spent during the nine-months ended September 30, 2012 by the Medical Affairs and Scientific Affairs departments, toward supporting the company’s selling efforts for its diagnostic testing services. Due to an accounting error, the cost was previously included within “research and development expenses”. 4 Merck Millipore is the division of Merck KGaA that supplies products and services for the life science industry. Key customer groups include research and analytical laboratories in the pharmaceutical/biotechnology industry or in academic institutions, and manufacturers of large and small molecule drugs. 5 2012 dollar figure differs from that in last year’s GEN list of Top 22 R&D Spenders Among Tools and Technology Companies, published April 2, 2013, reflecting currency fluctuations since then. 6 Differs from the $214.040 million originally reported by Bio-Rad last year, and published by GEN in last year’s list. The reduction of $4.8 million reflects a reclassification of a refundable French R&D tax credit to the expense category “Provision for income taxes,” since the company is not required to have taxable income in order to earn the credit. 7 2013 figure does not reflect Thermo Fisher’s acquisition of Life Technologies, which while announced April 13, 2013, was not completed until February 3, 2014. Life Technologies ceased reporting financial results after the third quarter of 2013, and thus is no longer included in this list. 8 Life Sciences & Diagnostics is the segment of Danaher Corp. that provides tools for biopharma research. Danaher’s life sciences business offer research and clinical tools used by scientists to study cells and cell components. Danaher’s diagnostics businesses offer analytical instruments, reagents, consumables, software, and services used by hospitals, physician’s offices, reference laboratories, and other critical care settings. 10 Unlike 2012 fiscal year, BD reported FY 2013 R&D spending, and comparisons stretching back to 2009, to the nearest whole number rather than in thousandths, to three places to the right of the decimal, or $471.755 million, the figure published by GEN in last year’s list. 11 Agilent’s fiscal years encompass the 12 months ending October 31. 12 Includes GE’s drug discovery and biopharmaceutical manufacturing technologies businesses, as well as businesses focused on medical imaging and information technologies, medical diagnostics, and patient monitoring systems. In March, the company finalized its acquisition of Thermo Fisher Scientific's cell culture, gene modulation, and magnetic beads businesses for $1.1 billion. 13 Figures furnished to GEN by a company spokesman. 14 Includes Roche’s Professional Diagnostics, Diabetes Care, Molecular Diagnostics, and Tissue Diagnostics businesses. On April 23, 2013, Roche announced that the Applied Science business area’s portfolio of products would be integrated within the division’s other business areas. The polymerase chain reaction (PCR) technology, the nucleic acid purification (NAP) and biochemical reagents lines are now managed by Molecular Diagnostics. 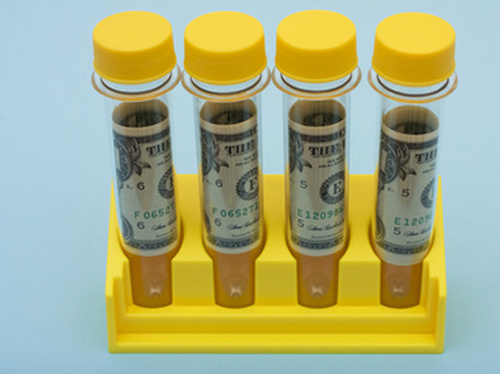 The Custom Biotech portfolio has moved to Professional Diagnostics. A dedicated unit has been established to focus solely on sequencing.